birds : Picked up a grapevine message at lunchtime that a Red Kite had been seen mid-morning over the Little Chapel, so I had my lunch on Candie Road in case it appeared over the Fauxquets. It didn't, but two Buzzards were performing nicely, with another one very high, and a female Blackcap was singing oddly in a nearby tree. Wasn't gripped at all by the kite as we had one over our house in April. 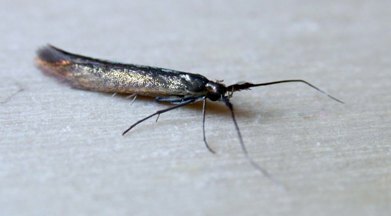 moths : A bit of microscope work produced a new moth for the garden from last weekend - Coleophora deauratella. nonsense : Having received my new passport a short while ago, I was surprised that it contained pictures of at least 9 species of bird. I thought perhaps that the passport office heard that I was a birder and 'pimped' my passport up accordingly. But alas, looking at Rosie's, hers was the same, so pretty standard it seems, but fab nonetheless. There's one less baby-dangling nutjob it the world it seems - too Bad.